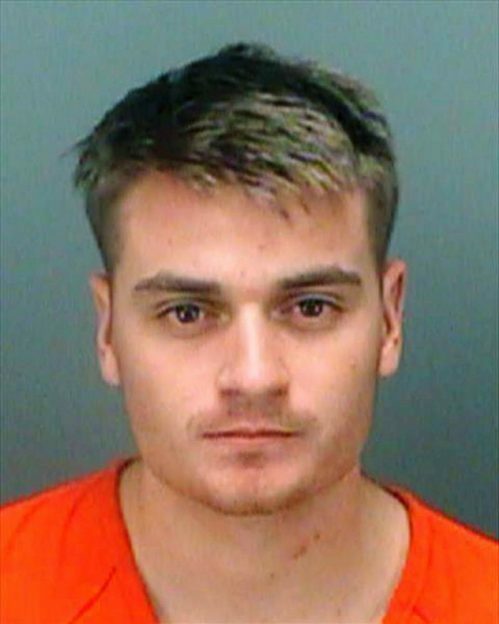 Florida Neo-Nazi group leader Brandon Russell was sentenced to 5 years in prison on weapons charges. Russell, 22, was sentenced Tuesday in federal court in Tampa. U.S. District Judge Susan Bucklew expressed concern for public safety when she sentenced Russell. Russell has been charged with storing explosives and having a destructive device in a New Tampa home last May. Russell was also charged with stockpiling the explosive material in the New Tampa apartment where a friend killed their two roommates. Russell, who was a private first class in the Florida National Guard. He pleaded guilty in September to possessing illegal firearms, a destructive device and storing explosives at a New Tampa home. Devon Arthurs, Russell’s friend, awaits trial in state court on charges of murdering their two roommates, Andrew Oneschuk, 18, and Jeremy Himmelman, 22, both of Massachusetts. Arthurs allegedly told investigators he killed his roommates for teasing him about his recent conversion to Islam. Russell set up a “mini-lab” in the garage, where investigators found explosive material stored in a cooler, near homemade detonator components and several pounds of ammonium nitrate, according to authorities. Inside Russell’s bedroom, authorities said, they found several firearms, ammunition and a framed picture of Oklahoma City bomber Timothy McVeigh on Russell’s bedroom dresser. Investigators also found a North Korean flag, multiple copies of Adolf Hitler’s “Mein Kampf” and other neo-Nazi and white supremacist propaganda in the apartment.